Chili is more than just a popular dish. It is one that many people are passionate about – and there are countless different versions to try out. There is plenty of debate about chili too, such as whether beans are included and whether the meat can be marinated first. 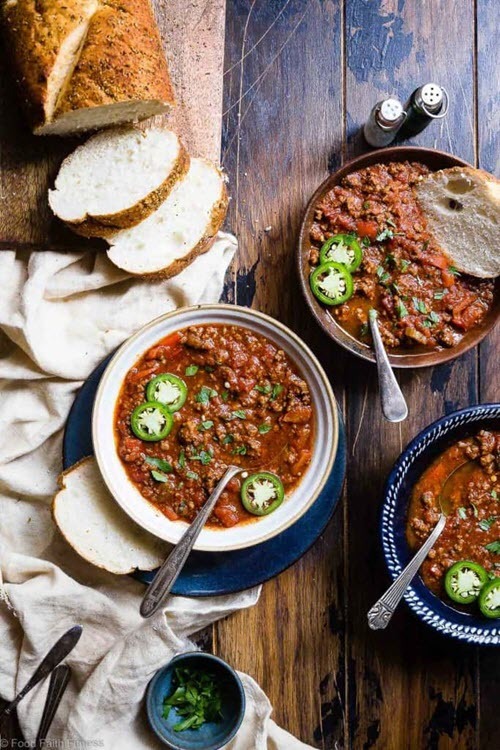 Regardless of the definition, chili is a hearty and warming dish. It's great for family meals, especially on cold winter nights. This is true for keto chili recipes too. 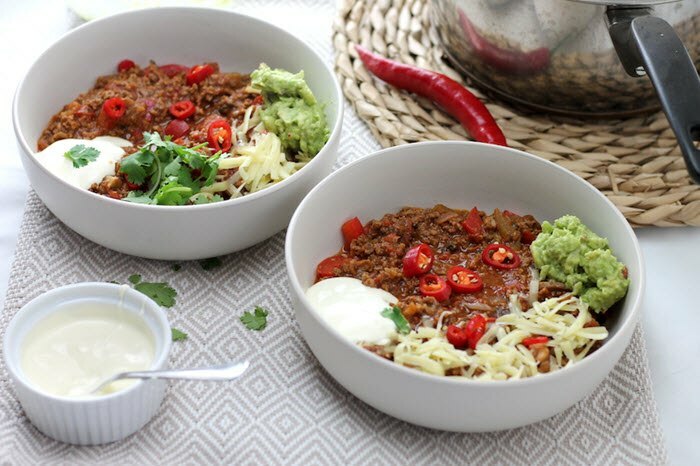 Keto versions have some differences in their ingredients, but they remain just as tasty as high carb chili recipes. The items in this list are all examples of that pattern. They also have their own distinct variations. Who knows? You might find a new favorite recipe to try. PS. You can also try out keto stew recipes for another type of hearty dish. Many of these can be made in the Instant Pot or in a slow cooker. PPS. 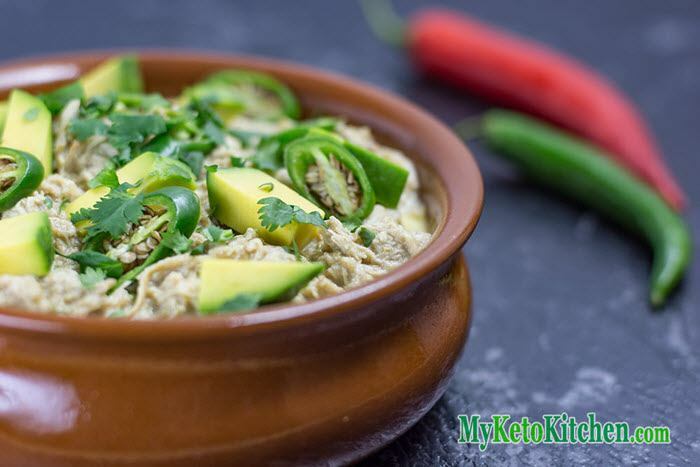 Another option is our keto ground beef recipe list. In the list, we highlight a wide range of different styles of recipe, including snacks, lunches and dinners. To start us off, here's a recipe from ketogasm.com. 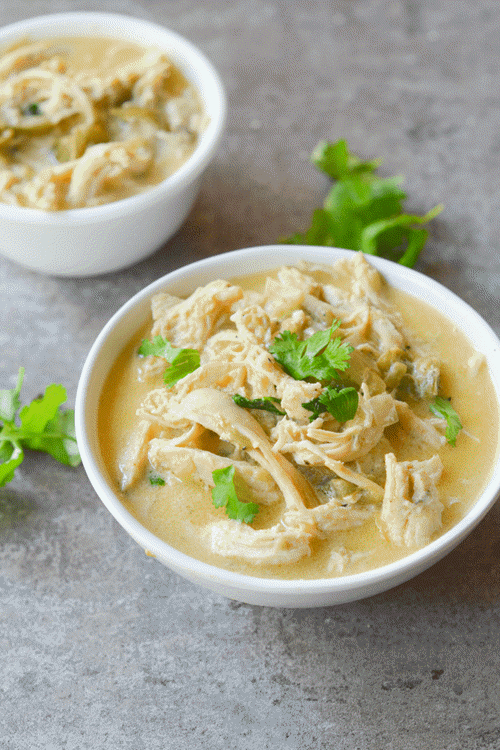 The tomatillo recipe is designed to be made in an Instant Pot and works wonderfully. Don't worry if you don't have an Instant Pot. The meal can be made in a slow cooker too. No matter how you make it, this chili has a great combination of flavors. 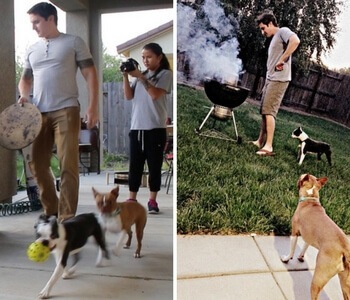 You'll find yourself coming back to the recipe time and time again. 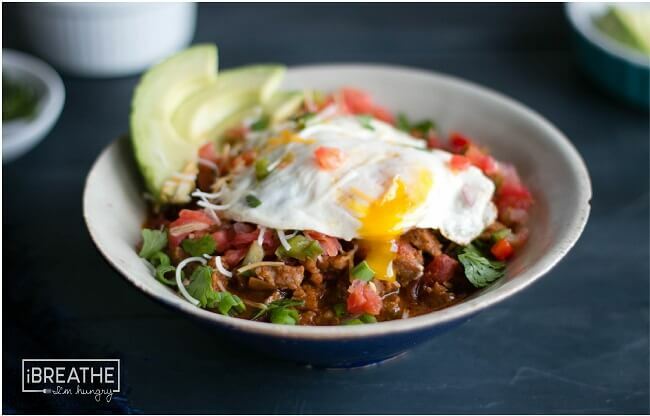 Chili isn't normally a breakfast choice, but why not? This version from ibreatheimhungry.com includes sausage in the mix and is even garnished with an egg. These aspects help make the recipe stand out and also help to create a distinctive breakfast style. Besides, it's always good to find a recipe that is a little bit unusual. White chili recipes work well if you want something a little bit different. This version comes from ketosummit.com. The name isn't just a reference to the color of the dish. It also refers to the texture and final consistency. Both of these areas are different than with a traditional chili recipe. Louise also offers plenty of extra information about what white chili is. 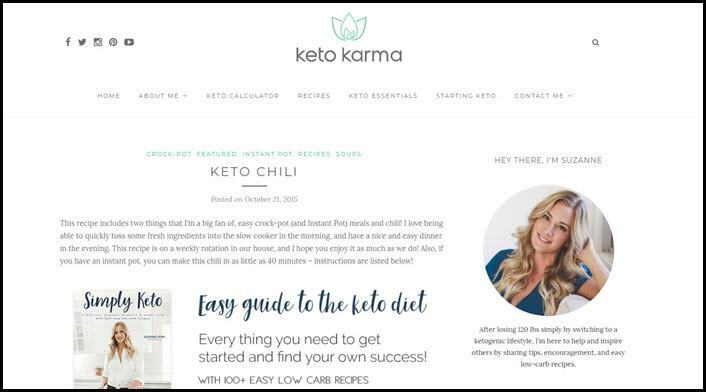 She even provides details about keto-friendly ingredients that you can add into the chili to make it your own. 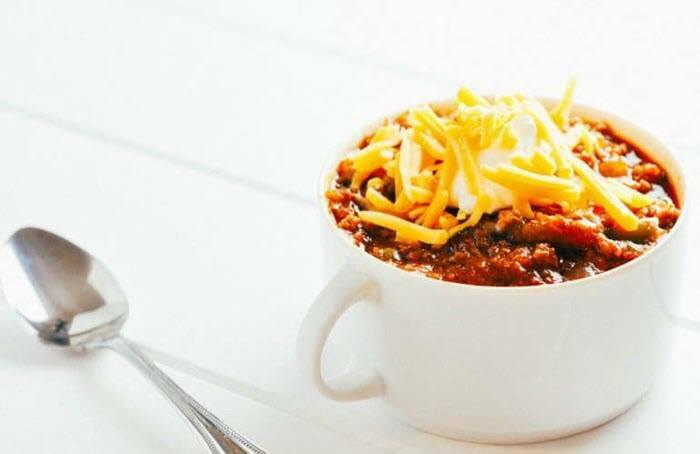 If you haven't made keto chili before, this recipe from ketodietapp.com is a fantastic place to start. It contains a great balance of meat and spices. Together these help to create a bold flavor. That flavor becomes even more intense if you stick the finished dish in the refrigerator and eat it the next day. 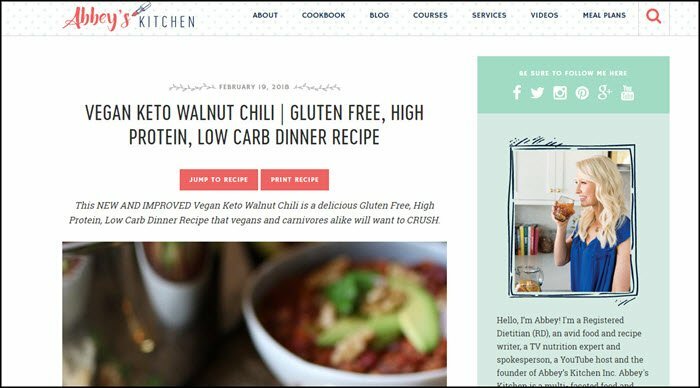 This recipe, from myketokitchen.com, offers a second white chili that you can try. 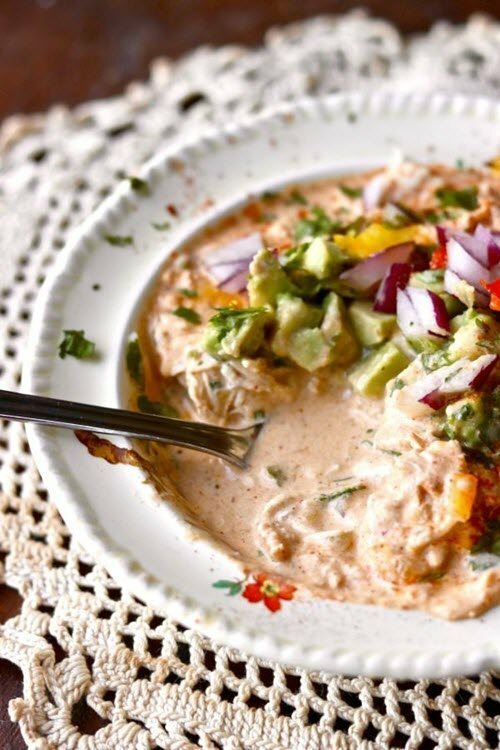 This version relies on shredded chicken as the meat of choice, while also featuring a Mexican flavor profile. The finished meal is a great alternative to traditional chili and tastes amazing too. Here's another style to consider. The recipe can be found at alldayidreamaboutfood.com. It includes pumpkin and chocolate. You don't normally find either of those ingredients in chili, but why not? While the flavor combination sounds odd, chocolate can be included in savory dishes and often works extremely well. This is another recipe that takes advantage of Mexican flavors to create something that is truly fantastic. The dish itself comes from Rachel at aussieketoqueen.com. She provides all the details that you need to create an amazing chili. Of course, it is the toppings that really make the recipe stand out. While the toppings do take a little extra work, they're certainly worth the effort. 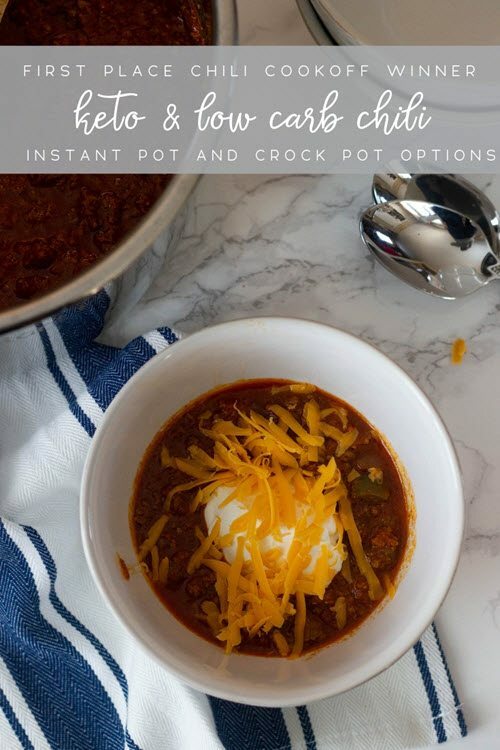 This chili recipe comes from beautyandthefoodie.com. It is packed full of flavor. The combination of spices, ground beef and veggies works perfectly, while the finished dish remains low carb, keto and paleo friendly. The Instant Pot style means that the work you need to do is minimal. What's not to love? Here's an interesting flavor combination to consider. The recipe comes from Shasta at ketosizeme.com and it is such a fantastic idea. The dish has all the classic flavors of chili, along with chocolate and coffee undertones. There are also plenty of other wonderful ingredients included, which all come together perfectly. 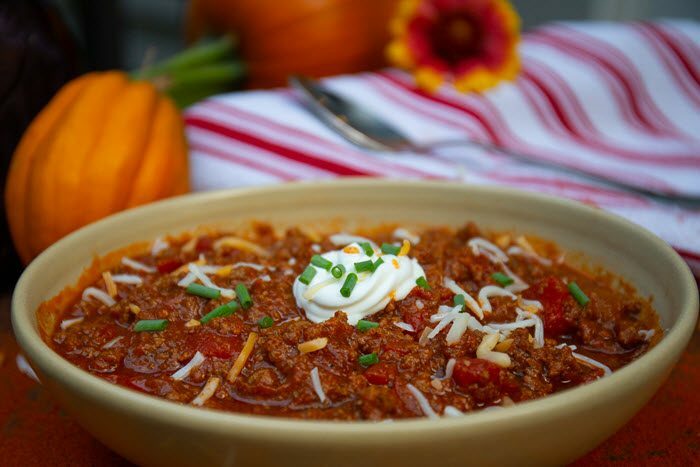 This pumpkin chili comes from wickedstuffed.com. As Amanda states, the pumpkin flavor works very well. The pumpkin helps to make the entire dish creamy and rich, without overpowering the chili flavor. There are plenty of amazing ingredients that help to make the flavor profile complex and interesting. You can also tweak the amounts of some ingredients to make the final taste perfect for you. 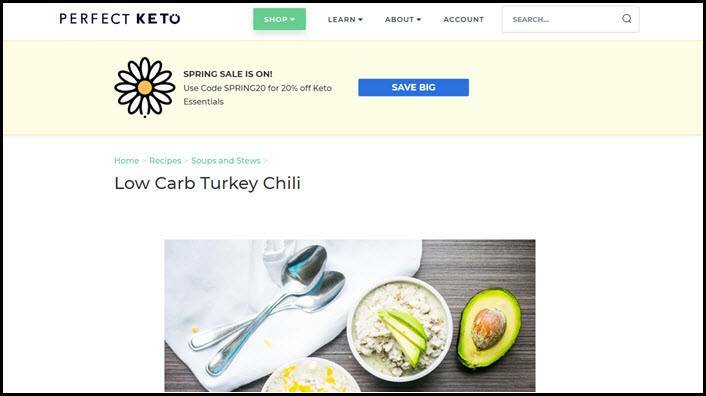 This recipe from perfectketo.com is a great choice if you don't know much about white chili. 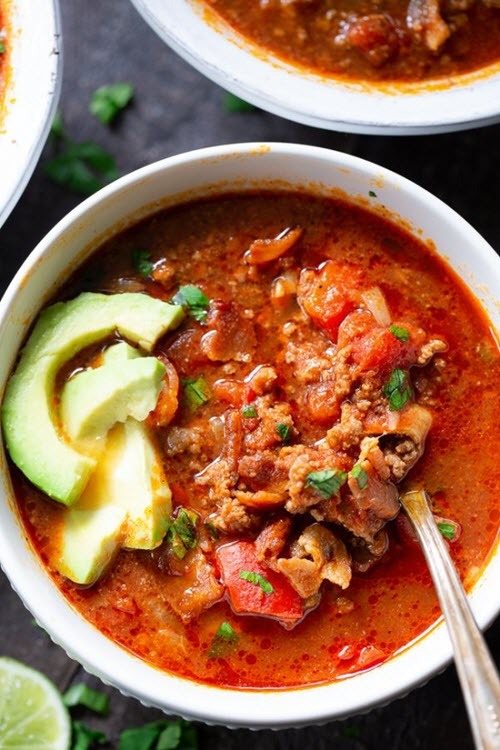 There is plenty of details about the differences between types of chili and the changes that you need to make to create a low carb version. The recipe itself is relatively simple, which gives you plenty of opportunities to play around with the flavors. Here's another type of white chili to consider. This one comes from whatgreatgrandmaate.com and is a vibrant choice. I love the way the chili looks in the bowl, especially with the sliced avocado and chunks of chicken. As the title highlights, the chili is also AIP compliant. This means that it avoids a range of ingredients, including dairy, nightshades, grains, gluten and eggs. AIP is perfect for people who are sensitive to food. The meals are also very healthy even if you're not following the diet. This recipe comes from joyfilledeats.com and it is a more traditional choice. The biggest difference between this and a non-keto chili is that this version misses out the beans. Honestly though, you won't even miss them. 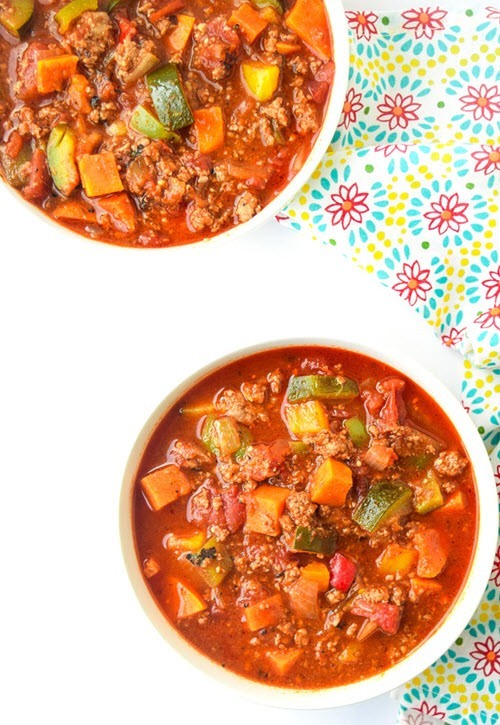 The chili is still full of flavor and offers plenty of protein to keep you satisfied. 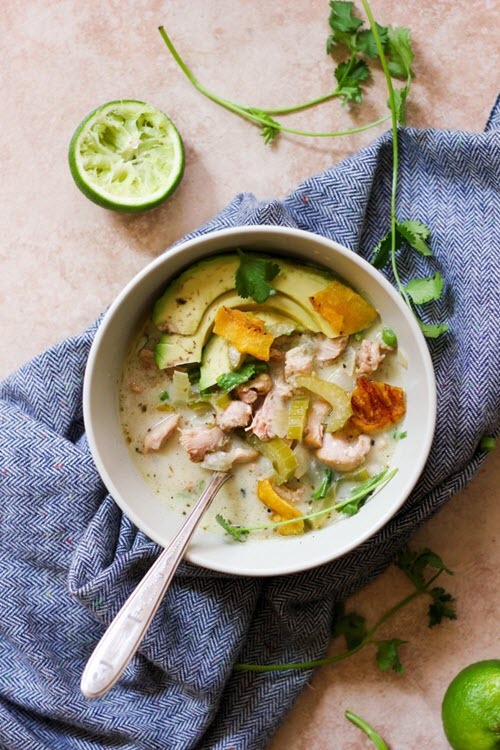 Marye from lowcarb-ology.com provides this white chicken chili for you to try. The recipe is creamy and rich, making it an ideal comfort food choice. The chosen topping is a nice extra touch. This helps to make the chili stand out so much more. Another factor is the recipe itself. It is a relatively easy recipe, without an excessive number of ingredients. This aspect could make it the perfect way to get started with white chili. This chili recipe uses a less common combination of ingredients – and tastes all the better for it. The dish comes from sweetcsdesigns.com. It's an ideal meal for cold evenings and any other time where you need comfort food. You have a decent amount of control over the flavor because you can change the type of sausage that you use. Your choice will influence the flavor of the finished chili. Here's another chili with an interesting flavor choice. The recipe is from Abbey at abbeyskitchen.com. 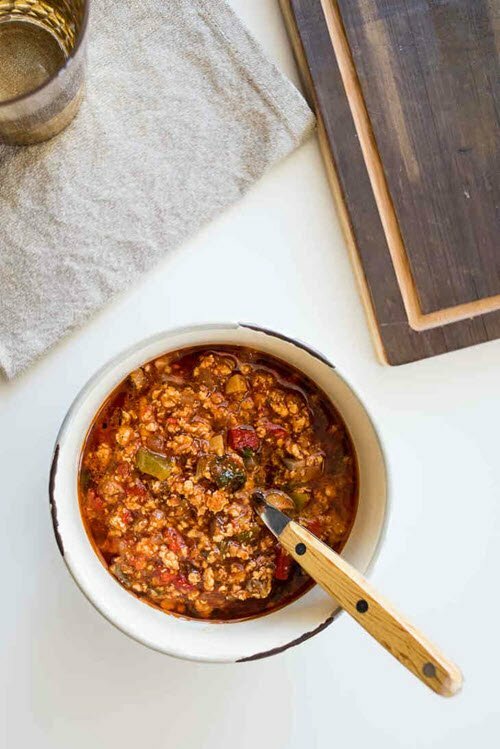 The inclusion of walnut changes up the texture of the chili. This isn't the only unusual part of the recipe either. There are some other interesting ingredients. I'm not going to go into them here, as it's best if you check out the recipe for yourself. 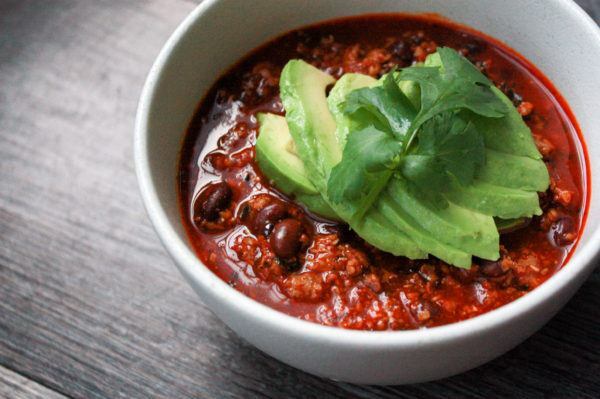 Bacon is a popular part of the keto diet anyway, so why not include it in chili? 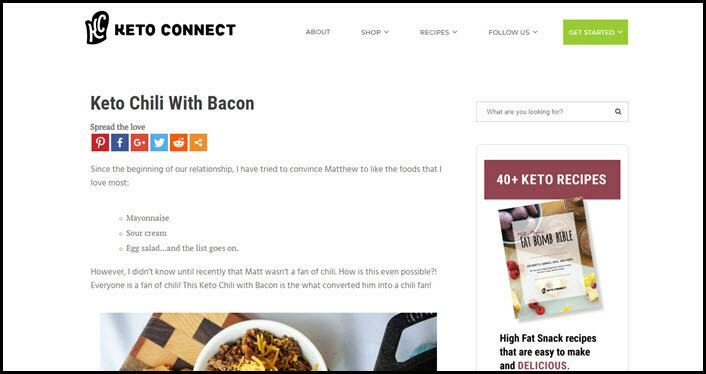 This recipe from Megha at ketoconnect.com does exactly that. The chili is even tasty enough to appeal to people who don't normally enjoy chili. That aspect is reason enough to try it out. Here's another recipe that includes bacon in the mix. This one comes from paleorunningmomma.com. I love the vibrant red color of the chili. It looks so amazing in the bowl. A color like this normally means that the chili will end up being delicious. This recipe follows a more traditional style and includes most of the ingredients that you would expect in chili. The style isn't a bad thing at all. 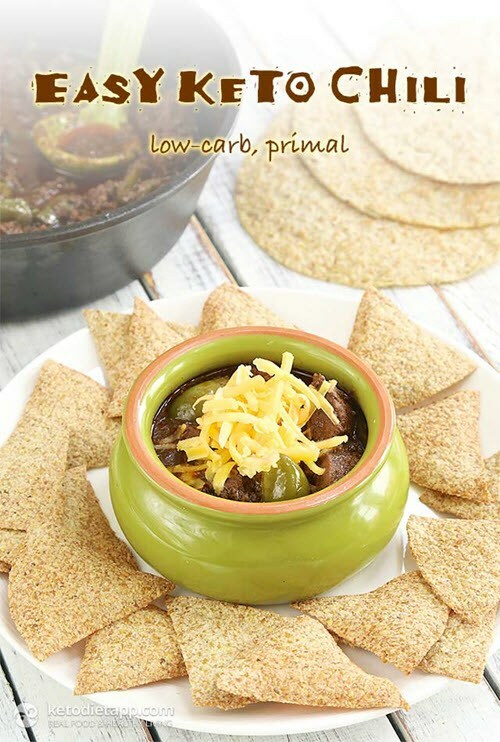 Sometimes all you need is a low carb version of chili, which is what this recipe gives you. You can find all the details at ketokarma.com. Sam from heyketomama.com offers this white chicken chili. 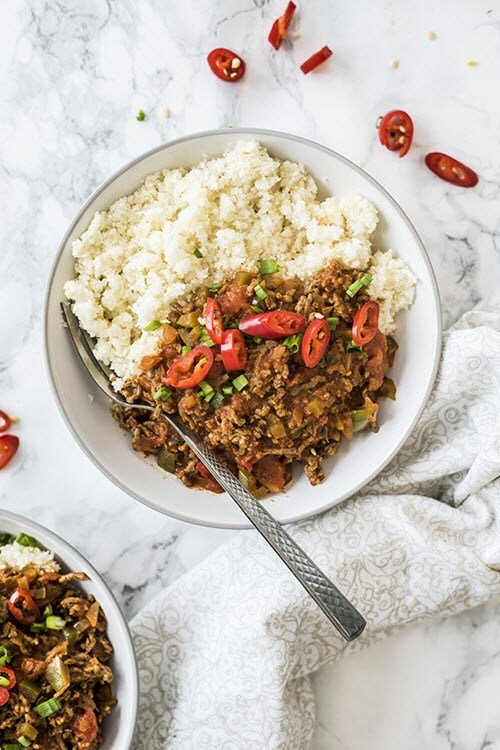 The style is similar to some of the other recipes on this list, but the chili doesn't have as many vegetables. Instead, the flavors of the chicken strongly dominate. The dish is even better when you throw some cheese on the top. 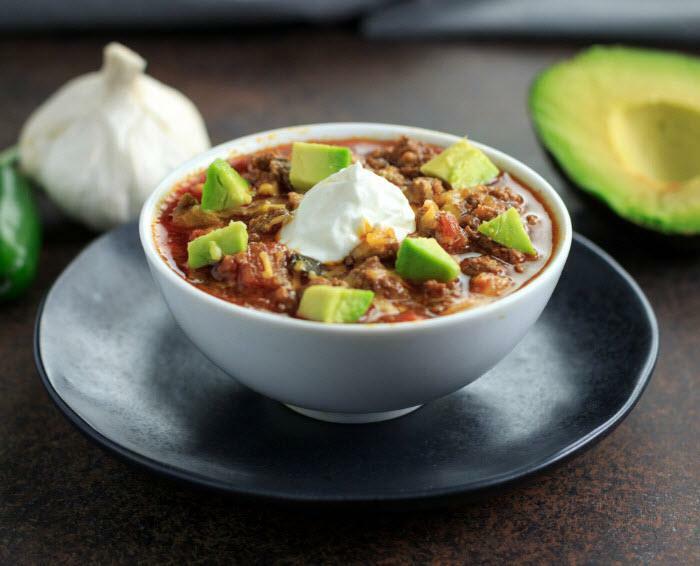 This Easy Keto Chili Recipe comes from eatingonadime.com and is an easy version to prepare. The flavors aren't too complex either, making this a good dish for adults and kids alike. As Carrie mentions, you can create the chili using ground beef or ground turkey. Your choice will influence the final flavor, but both versions will taste delicious. 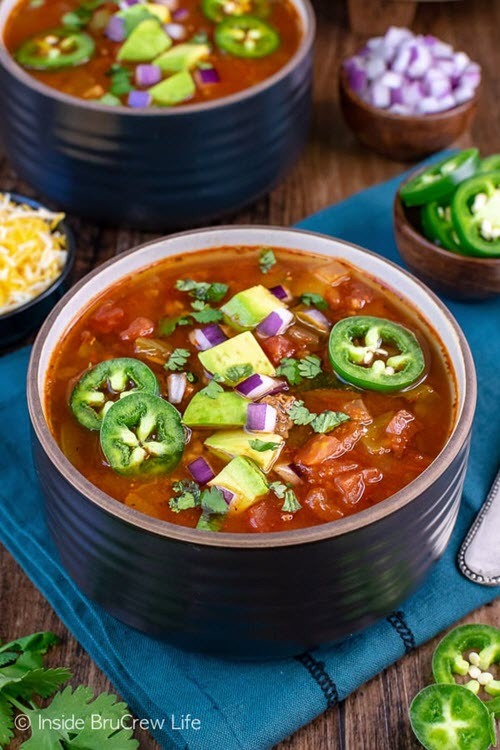 This chili recipe is perfect for vegan, vegetarian and keto dieters. It relies on black soybeans as the main protein source. These beans are relatively low in carbs while offering plenty of protein and fiber. 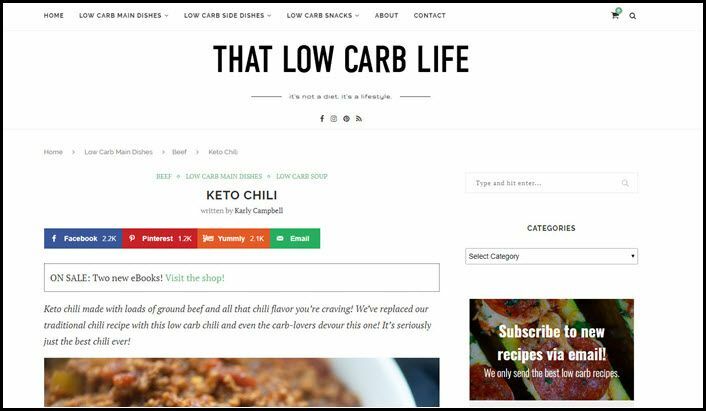 You can find the steps at compassionateketo.com, along with the ingredients list and nutritional information. 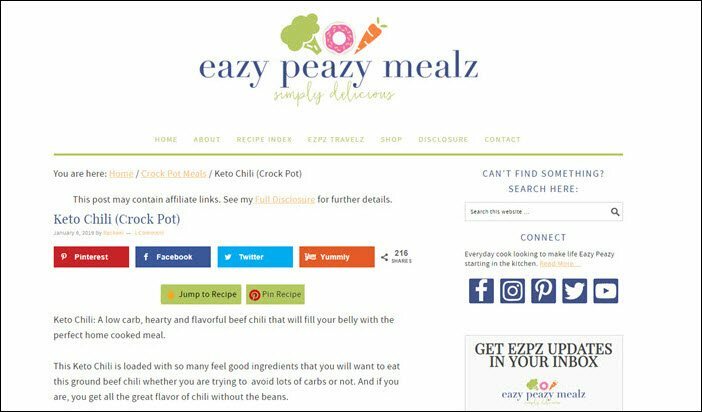 This recipe is from eazypeazymealz.com. As that site name suggests, it is an easy dish to prepare. The ease is partly because you're making this in a slow cooker. You don't need to worry about having a pot on the stove for hours or anything else complicated. 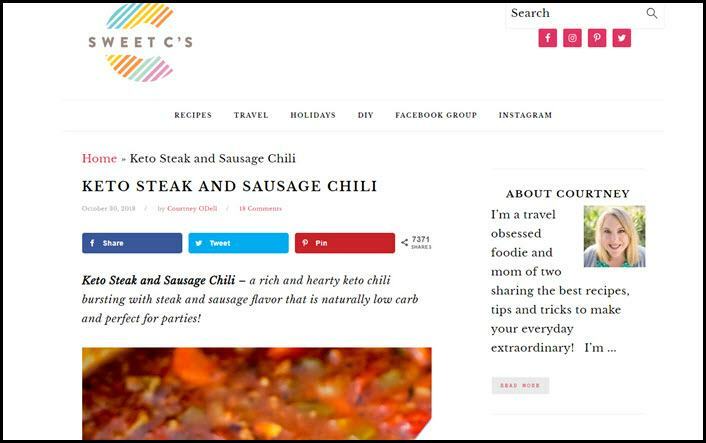 The chili from Vicky at tasteaholics.com looks a little different than the other entries on this list. It doesn't have nearly as much sauce and doesn't focus on tomato as a flavor either. The recipe is also designed as a complete meal. To do so, it includes details about making cauliflower rice to go along with the chili. 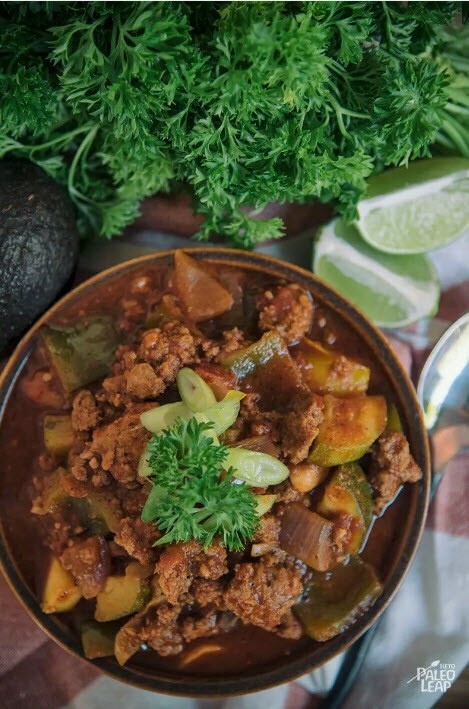 You can find this chili recipe at ketogenic.com. The inclusion of pumpkin changes the flavor profile, making the whole dish taste more interesting. Despite that difference, this is a fairly easy keto dish to create. The ingredients list is short and many of the items on it are to add to the final taste. Here's a second recipe that takes advantage of pumpkin. This version comes from thecastawaykitchen.com. It is a more complex recipe than many others, with plenty of different flavor components. Some of the ingredients also add extra creaminess, making this a particularly rich and satisfying recipe. 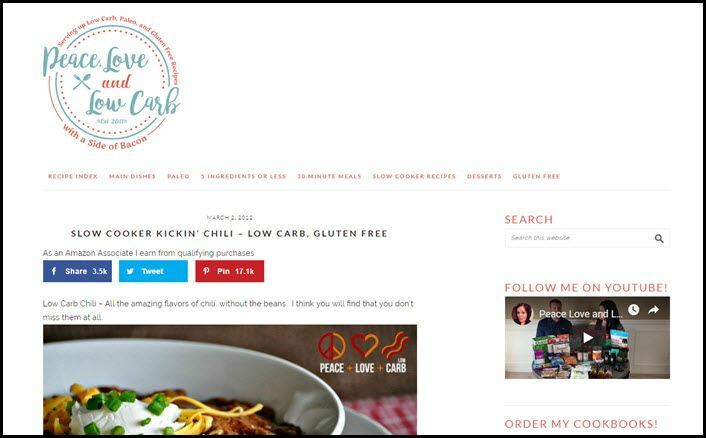 Kyndra from peaceloveandlowcarb.com provides this chili recipe. It is another version that relies on classic ingredients and flavors, while still keeping the carb content low. 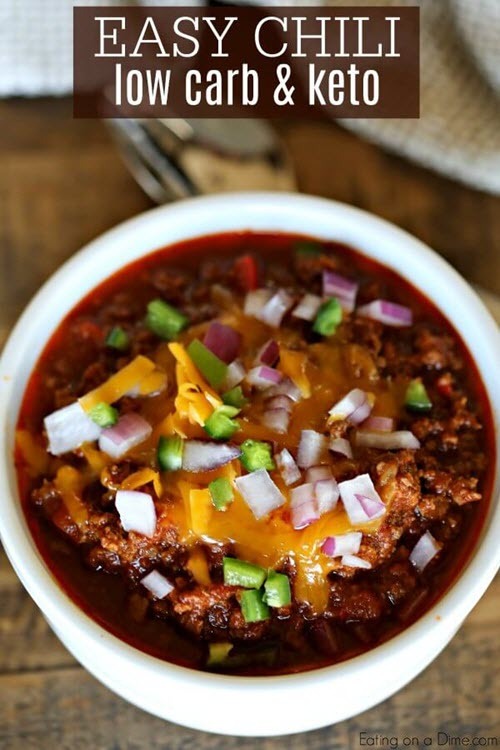 Recipes like this one would be perfect for anyone who loves regular chili. You might even find that you like the low carb version more. This chili recipe has a nice balance of flavors, especially as it includes chicken and bacon as sources of protein. The style is fairly unusual, as most chicken chili recipes end up being white chili. Still, unusual isn't a bad thing and is a good way to get variety into your diet. You can find the recipe for the dish over at ketosummit.com. 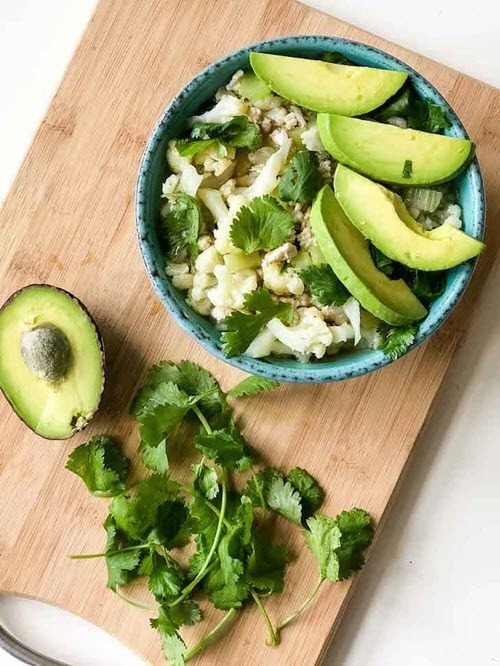 This recipe, from foodfaithfitness.com, is perfect for keto, paleo and Whole30 dieters. It's also made in the Instant Pot, making it an easy meal to get on the table. If all of that weren't enough, take a look at how the chili turns out. The finished dish looks amazing and would have no shortage of flavor. 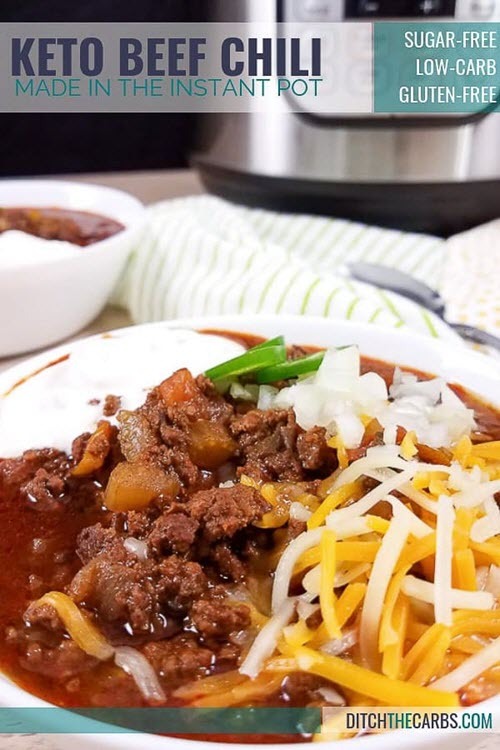 The title of this chili comes from the fact that it won first place – in a non-keto chili contest! That’s a pretty impressive outcome, as some people feel that keto foods aren’t nearly as good as their non-keto counterparts. This recipe puts that idea to rest. Unlike some other recipes, this chili is light on veggies, getting most of the flavor from herbs and spices instead. That style works well, as you could easily serve veggies on the side. Chili like this can also be used in many different ways. You can see the recipe for yourself over at ketoinpearls.com. 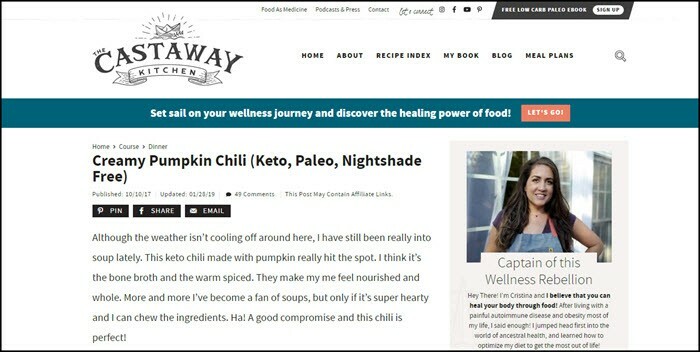 This chili recipe comes from paleoleap.com. It’s a chunkier version than the other featured recipes, which is perfect if you want something hearty. Honestly, there’s something about chunky recipes that just seems more filling than their regular counterparts. To make things even better, this is a fast recipe. It takes just 45 minutes to cook. 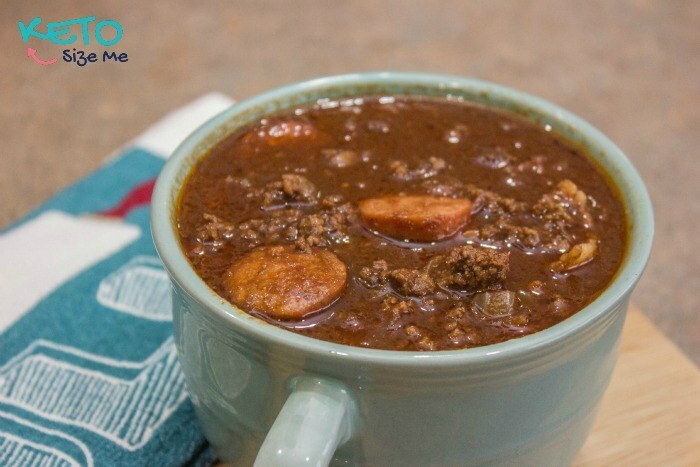 This is a fun version of chili, as it uses two different types of meat – beef chuck and beef stew meat. The approach gives a different texture than just a single type of meat. 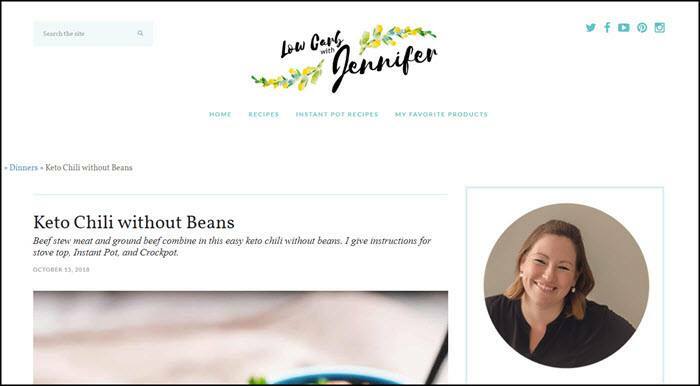 Jennifer (from jenniferbanz.com) also provides instructions for making this in the Instant Pot, the slow cooker and on the stovetop. This allows you to choose whichever approach works the best for you. With this recipe, you’re relying on ground turkey and beef, rather than one or the other (although, you could substitute the ground beef for dark ground turkey). The style creates a nice contrast of flavors. The flavors get even better once the other ingredients are added in. Julia, from savorytooth.com, even breaks the recipe up into two parts – one for the main ingredients and the other for the spices. By doing so, she makes the recipe easy to follow. While this recipe might seem meat-heavy, there is a large number of veggies packed in there as well. 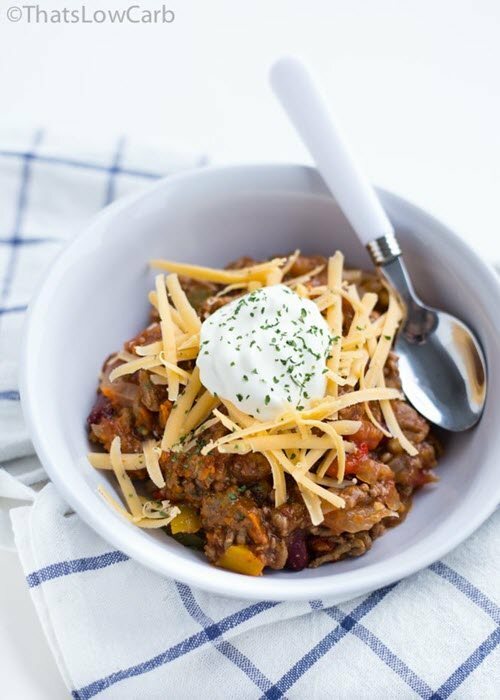 Libby, from ditchthecarbs.com, gets the balance exactly right, giving you a nutritious chili dish that isn’t lacking in flavor. The ingredients list even includes jalapenos, so be prepared for a spicy kick. This chili manages to be easy and stunning at the same time. I love how the topping is pretty simple, but has such a large impact on the overall appearance. The recipe is hosted at insidebrucrewlife.com and Jocelyn provides details about a variety of toppings that you can use. You’re also able to change the amount of broth to influence how thick the chili ends up being. This recipe, from tastythin.com, is unusual because it includes sweet potato in the mix. The inclusion is partly to make the recipe suitable for Whole30 dieters, as they cannot have beans. 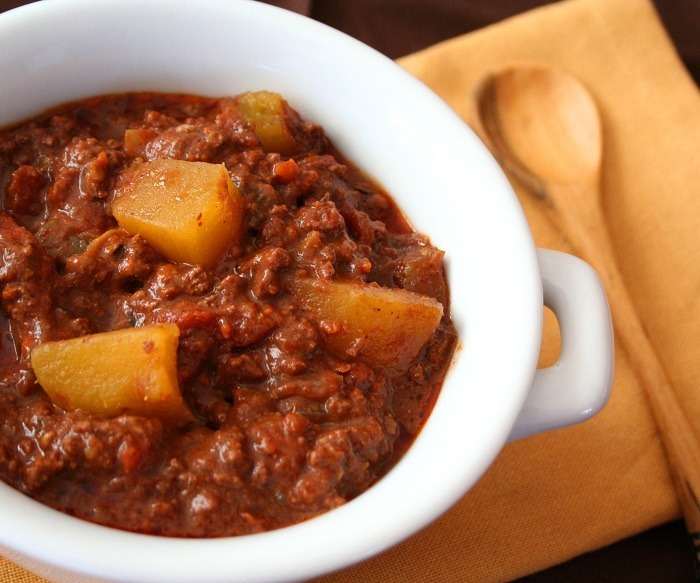 Even with the sweet potatoes, this chili remains perfect for low carb dieters. It’s also appealing simply because the flavors are different than normal. Besides, the finished dish just looks stunning. Here’s one final keto chili dish. This recipe comes from thatlowcarblife.com and will even appeal to people eating a regular diet. That outcome goes to show that chili really doesn’t need to be high in carbs. You can also choose to leave the jalapenos out from the recipe if you want a dish that isn’t as spicy.